Making sure your baby gets enough sleep while you’re on vacation is key to having an enjoyable trip. A well-rested baby can be a joy to travel with; a tired and cranky one–not so much. 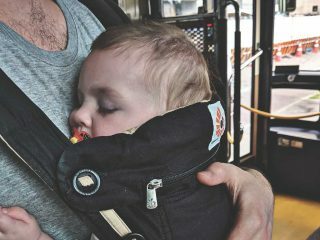 That’s why it’s a good idea to plan ahead and have a strategy in place for getting your baby to nap during your trip. 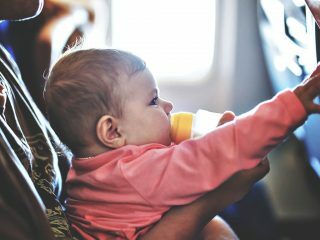 Try following these 8 tips and tricks I’ve put together to keep your baby well rested, and make traveling with a baby as enjoyable as possible. It’s a good idea to try to follow your baby’s usual routine as closely as you can while traveling. For example, if your baby is used to napping mid-morning, try to organize your itinerary to allow them to nap as close to that time as possible. Of course, this can be challenging, especially if your baby is jet lagged or if you’re traveling with a large group of people, so try not to stress if you can’t always follow your usual schedule exactly. If a nap can’t happen when it “should” every once in awhile during your trip, simply roll with it, and then do your best to make sure the rest of his naps are restorative. Depending on your baby’s temperament and usual napping environment, you don’t necessarily have to go back to the hotel room for nap time. If your travel plans include a long car ride or a lengthy stroll through a museum, your baby may be just as happy to nap in their car seat, stroller or front pack as at your accommodation. Sticking to your baby’s normal sleep schedule is not always possible, so when in doubt, aim for at least one good nap each day. If your baby is used to napping in a crib in a dark, quiet room, it is a good idea to try to fit this into your travel plans at least once a day. Obviously, you don’t want to spend your entire vacation sitting in a hotel room, so any other naps they usually take may need to be skipped or taken on the go. One good nap per day is usually enough to keep a baby from getting overtired, at least for a few days. Aim for one of your baby’s usual nap times. If your baby usually has an easier time falling asleep in the afternoon than in the morning, try to organize your schedule around an afternoon nap. Try to mimic their usual napping environment and bring along any blankets or toys they are used to napping with. Don’t forget to put out the “Do Not Disturb” sign. The last thing you want is your baby waking up in the middle of their one precious nap of the day. If you’re only able to fit in one good nap, or your schedule doesn’t allow your baby to settle in a dark, quiet room, you may be able to schedule activities during your trip that allow your baby to nap on the go. Whether or not your baby is able to nap while you’re out and about will depend on their temperament and how good of a napper they are. Of course, some activities are much better suited to helping your little one get to sleep than others; a quiet stroll through a museum or gallery or an afternoon in your arms under a beach umbrella are certainly preferable to a theme park or concert. Unless your baby is like ours and would prefer a crowded cafe with lots of noise for sleeping. Car rides and even walking or hiking (if you have the right equipment) are other good nap time activities, especially if your baby has an easier time falling asleep in motion. Making sure you have the right gear–such as a front pack or backpack for hiking–is essential to helping your baby nap on the go. Although it can be a pain to pack extra gear (especially if you’re flying) you are much more likely to enjoy your trip if you have what you need to make your baby comfortable during nap times, whether in a hotel room or out and about. A baby monitor (great if you are staying in a resort and want to leave the room to lie by the pool). If your baby isn’t getting in as many (or as long) naps as they usually do, sticking to their usual bedtime, at least most days, is important to give them a chance to catch up. When you’re on vacation, it can be tempting to stay out late sightseeing or going out to dinner, especially if you’re traveling with friends who don’t have little ones (and early bedtimes) to worry about. If possible, try to resist the urge to stay out too much past your baby’s regular bedtime. If you’re traveling with a spouse, partner, or parent who can share bedtime responsibilities, you might consider alternating nights out. By taking turns going out for dinner you both get a chance to enjoy some alone time, explore the city and try eating at some places you wouldn’t want to bring your baby to. Just remember that when it’s your turn to eat out you’re responsible for bringing back take out. Another option is to hire a babysitter for planned evening events and activities. Although you might not feel comfortable doing this in a foreign country. The idea is to keep your baby on their usual sleep schedule to the extent possible. This will help your baby make up for any missed naps and also help them get back into their usual routine more quickly once you get home. Just like with your little one’s bedtime, if you’re traveling with a spouse or partner, you may not both need to go back to the hotel room when your baby’s naptime rolls around. Consider taking turns. One partner can go out and explore your destination or relax on the beach while the other takes the baby back to the hotel room for their nap. Traveling with a baby can be exhausting, so you may find you end up appreciating the downtime yourself when you’re on nap duty. If there are specific events or attractions your partner wants to see that you’re not as interested in (or vice versa), your baby’s nap time might be a great opportunity to do these activities. Nap time doesn’t have to be wasted time. Instead of sitting around wishing you were out enjoying yourself and exploring, use the time your baby is asleep to get organized, plan the rest of your trip’s activities, prepare bottles (if you’re pumping or using formula), and maybe even get some rest yourself. 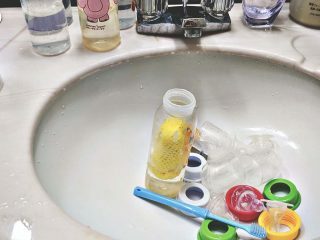 If you’ve traveled with a baby before, you know how tiring it can be and how hard it is to stay organized, especially if you tend to overpack, like I do. Your baby’s nap times are often the best times to unwind, rejuvenate, read a book, and/or prepare for the rest of your trip, so don’t let those hours go to waste. Traveling, especially when it includes time zone changes and jet lag, can throw off anyone’s sleep schedule. It can be especially hard for babies to re-adjust when they get home. 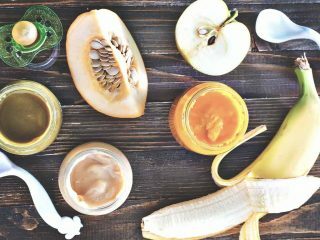 Kids (and especially babies) thrive on schedules and routines, and a lengthy trip can really throw off their normal sleep patterns. Make sure you’re on the same page as your spouse/partner and everyone else in the family when it comes to nap times. You may have adjusted your rules and strategies to help your baby sleep while you were on vacation, so it might be helpful to clarify these when you get home. Re-adjust to your local time zone as quickly as possible. It can be tempting to slowly drift back toward your baby’s normal nap times when you get home, especially if your trip took you to a different time zone. Try to resist this urge and be as diligent as possible about nap times as soon as you get home. Don’t feel guilty or get discouraged if it takes your baby a little while to re-adjust to their usual schedule. It will happen. It may just take some time. 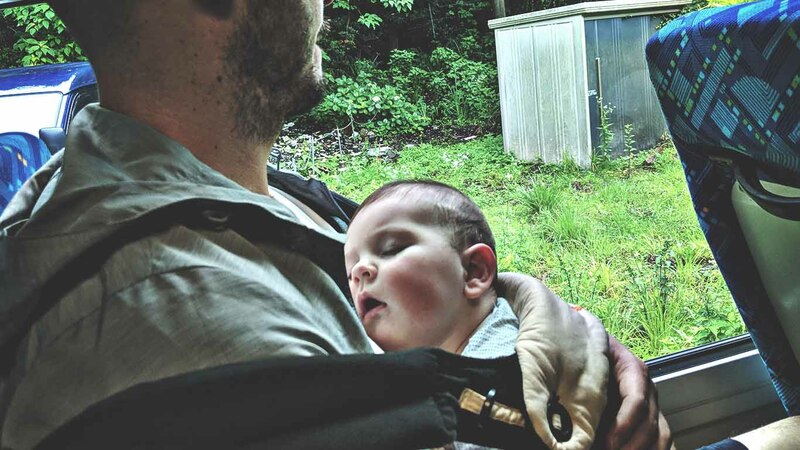 Following these 8 tips and tricks for managing your baby’s naps while on vacation will hopefully help you (and your baby) enjoy your time away from home without too much extra stress. I hope you found this article useful. Feel free to leave any thoughts, comments, or tips of your own in the comments below and share the article if you found it helpful. Happy travels! wanderingcubs.com is a participant of the Amazon Services LLC Associates Program, an affiliate advertising program – it is designed to provide an aid for the websites in earning an advertisement fee – by means of advertising and linking to Amazon.com products.